In 1990, liver transplantation, the only effective treatment for end-stage liver disease was being performed in most of the Western world and Southeast Asia. The operative success rate then was 86% and the 5-year survival 70%. At the same time, more than 200,000 people were dying in India every year from liver failure without any hope of receiving a transplant. It was in that year that Late Shri Rajiv Gandhi, the then Prime Minister of India, urged the ministry of health to initiate liver transplant (LT) in India. A committee set up by the Minister of Health to examine this issue and several meetings were held all across India and also based on Singhvi committee recommendations, the Transplantation of Human Organs Bill was passed by Parliament in the year 1994 and became the law in 1995. 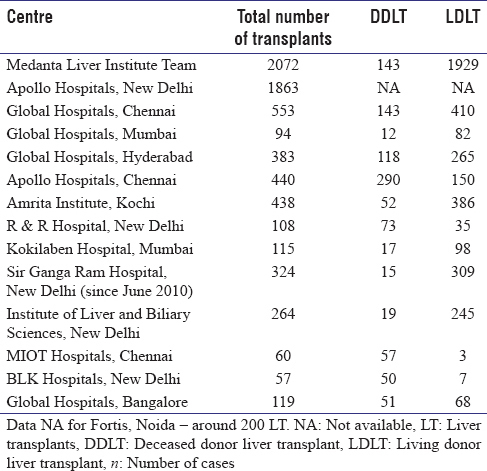 The initial transplants that were performed in the Apollo Hospitals, Chennai and AIIMS in 1995 and 1996 were unsuccessful, and it was only in 1998 that the first successful cadaver transplant and a living donor LT (LDLT; where a portion of the liver is removed from a living donor) were performed by the first author and his team at the Indraprastha Apollo Hospitals, New Delhi. Except for the transplant procedures in the Apollo Hospital (New Delhi), there was little progress until 2004 since when there has been a major increase in numbers of LT operations and centers in India. Until 2004, only 131 transplants were performed in 15 centers across India. Since then in the last 10 years, the transplant activity has picked up in India primarily spearheaded by LDLT centers in Delhi. Recently, deceased donor LT (DDLT) activity has picked up in the Southern part of India. The transplant act amendment that was notified in 2014 has brought significant changes in the certification of brain death, simplified procedures required for certification and allowed organ retrieval based on the temporary license. At present, the need for liver transplantation in India is estimated to be around 20/million population (or 25,000 LT per year). The current rate of LT performed in India is around 1.2/million population. Around 1200 and 1400 LT have been performed in India in the years 2013 and 2014, respectively. 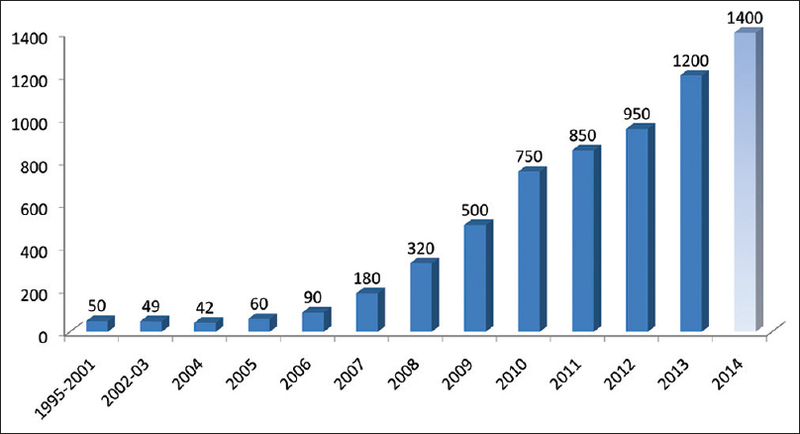 The annual trends in the number of LT in India have been shown in [Figure 1]. Rs. 2 and 2.5 million rupees in hospitals that have a successful ongoing program. The highest Indian figures are still about one-fifth of the current costs in Western countries. These data indicate that LDLT is essential for saving the majority of lives from end-stage liver diseases in India. DDLT in India is largely restricted to its Southern part with Tamil Nadu leading the way with 665 LT until October 2015 with a current organ donation rate of 1.3/million. In North India, DDLT is mainly performed in Delhi and Ahmedabad in the public sector hospitals. In Maharashtra, Karnataka, Bengaluru, and Tamil Nadu, there are zonal coordinating bodies that are entrusted with policy making, maintaining patient waiting lists, and coordinating sharing of organs. In the North, however, such bodies have not yet been formed. Overall, the current donation rate of 0.3/million in India needs to rise to at least 5-10/million to make a difference to the current waiting lists of patients who do not have suitable live donors. In comparison, the donation rates in the US, UK, and the rest of Europe are between 18 and 35/million. 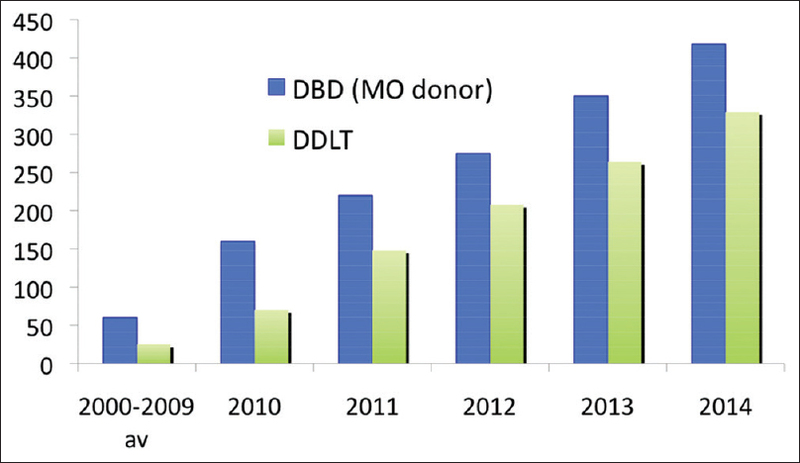 The annual trend in the number of donation after brain death and the number of DDLTs performed in India from 2000 to 2014 are depicted in [Figure 2]. Our team at Medanta has performed 2072 (29.2%) of all the LT in India. Currently, our team is performing 350 LT in a year with a success rate of 95% (operative mortality 5%). Ours is the largest LDLT program in India and among the largest in the world. Apart from standard LDLT and DDLT operations, our successful innovative approaches include swap transplantations, ABO incompatible transplants, combined liver-kidney transplants, and dual lobe transplants. The spirit of living donation mandates that the decision to donate should be free, voluntary, and informed. A detailed and thorough evaluation is an important multistep process, with more intensive and invasive tests reserved until later in the process to minimize the risk of surgery and optimize donor safety. The living donor should be between 18- and 55-year old, blood group matched and with a body mass index (BMI) preferably <33. The donor is evaluated and selected by a multidisciplinary team consisting of a surgeon, hepatologist, anesthetist, and psychiatrist. Potential donors are counseled about the evaluation process, and their willingness is confirmed. A detailed history and physical examination is undertaken, especially history of previous Hepato-Pancreato-Biliary surgery. Hematological, biochemical, and serological workup includes hemogram, liver and renal function tests, and viral markers. Next step is to evaluate for steatosis, which is generally performed by using liver attenuation index (LAI = L-S) or liver/spleen ratio on the plain computed tomography (CT) scan; alternatively magnetic resonance imaging may be used. If their verdict is equivocal, a liver biopsy should be performed. The indications for a liver biopsy are LAI <5, BMI >30, deranged lipid profile, and borderline volumes. The next step is a triphasic liver CT scan for volumetry with calculation of graft to recipient weight ratio (GRWR) and estimation of future donor remnant volume. The acceptable minimum amount of remnant is 30% (28% left lobe +2% caudate) and the ideal GRWR is 0.8. The dynamic CT scan also gives a roadmap of hepatic vasculature for surgical planning. This is followed by magnetic resonance cholangiopancreatography to outline biliary anatomy. Cardiorespiratory evaluation is performed by electrocardiogram, echocardiography, and pulmonary function test, and risk analysis by cardiologist and pulmonologist. Invasive coronary or pulmonary imaging and carotid Doppler may be indicated in older donors with other risk factors. Finally, donor undergoes psychiatrist, gynecology, and thyroid and anesthesia evaluation. Inadequate volume, steatosis, and medical risks remain important reasons for rejection of donors. The problem of low graft volume may be managed by graft inflow modulation or use of dual lobes in the recipient, both of which do not increase the donor risk. Donor steatosis may be reduced by following a dedicated exercise and weight loss regimen. However, potential donors with inadequate estimated remnant or significant medical risks should not be accepted for donation. With increasing experience, many centers including ours seldom reject donors for anatomical variations. The common etiologies of liver disease necessitating LT among adults are hepatitis C (24%), alcoholic liver disease (22%), nonalcoholic fatty liver disease (21%), and hepatitis B (18%). 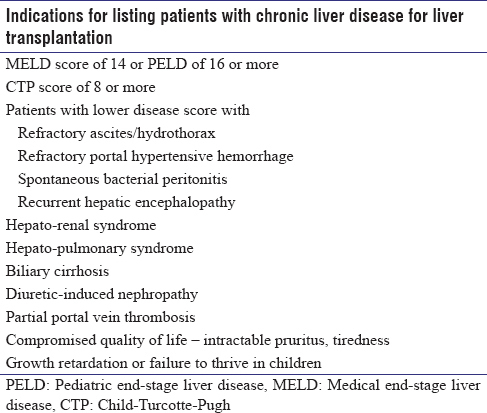 LT is indicated once decompensation (jaundice, gastrointestinal bleed, synthetic dysfunction, ascites, and encephalopathy, [Table 2]) supervenes in end-stage liver disease, or for metabolic diseases in which liver either becomes diseased (for, e.g. tyrosinemia) and/or an enzymatic deficiency causes other serious systemic consequences (primary hyperoxaluria, maple syrup urine disease, etc. ), acute liver failure (sudden onset coagulopathy, encephalopathy, and jaundice over a few days to weeks), or in hepatocellular carcinoma (HCC) if the disease is limited to the liver and has not invaded its vascular inflow or outflow. Pediatric LT is performed in only very few centers in Delhi, Chennai, and Bangalore. Our center at Medanta currently performs the largest number of pediatric LTs in India. We have so far performed 182 pediatric LTs. Sixty percent of the children were males, and the median age was 5 years (4 months – 17> years). Our smallest child weighed only 4.2 kg at the time of transplant. Among the indications, acute liver failure and acute on chronic liver failure (Wilson's disease made up 45% of these) accounted for 30% of pediatric LTs. Metabolic liver diseases that were largely undiagnosed and untreated before accounted for 31% of the pediatric LTs in our series. Among children with chronic liver disease, the most common indication for transplant was extrahepatic biliary atresia. Without a transplant, patients with decompensated chronic liver disease have a 1, 3, and 5 years survival rate of 45–70%, 25–45%, and <10%, respectively. 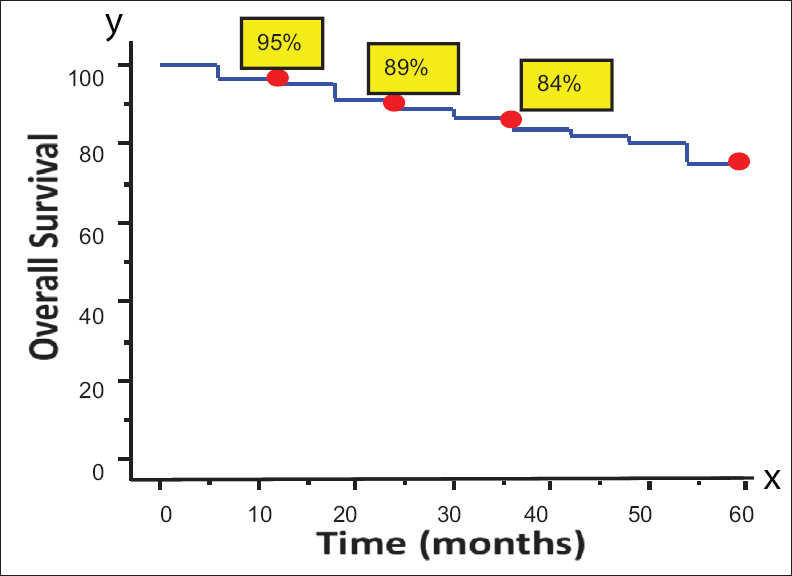 In comparison, at Medanta, out of 1984 LT with at least 3 months follow-up, the 1, 5, and 10 years survival has been 92%, 83%, and 79%, respectively. Among 182 pediatric transplants, the 1- and 5-year survival was 97% and 91%, respectively. Among 151 emergency transplants, the 1- and 5-year survival was 91% and 89%, respectively. Hepatic artery thrombosis rates are 2.5%, whereas portal and hepatic vein thrombosis rates are both <1%. Our 5 years biliary complication rates are 11%. These results are comparable with the best reported from elsewhere in the world [Figure 3]. While hepatic vascular invasion and extrahepatic spread of HCC are universally accepted contraindications to LT, the current acceptance criteria for transplantation are based on the size and number of HCC lesions. Patients are considered for DDLT by Milan (<5 cm single lesion or <3 lesions, each <3 cm) or UCSF (single lesion <6.5 cm or <3 up to 4.5 cm each) criteria. In 2009, Mazaferro (the original proponent of Milan criteria) reported that conventional Milan criteria may be too restrictive for many patients with HCC, who would otherwise benefit with LT. Furthermore, DDLT criteria for HCC may not be applicable to LDLT as there is no competition for a donor liver, fewer dropouts due to disease progression and a possible survival advantage due to an elective, optimized recipient, and better graft., We and majority around the world believe the same and have used extended criteria in LDLT for HCC. 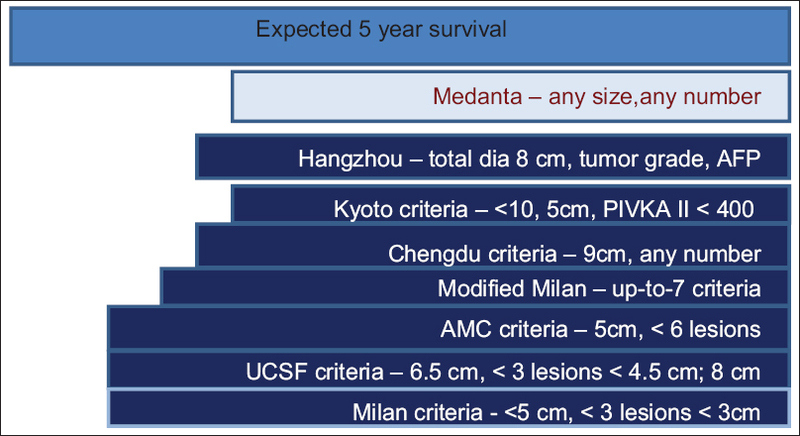 The 3- and 5-year survivals of around 60–87% are published with various extended criteria., Our results are comparable and are depicted in [Figure 4]., [Figure 5] shows the overall survival in 174 LDLT for HCC at Medanta. Currently, we use midline incisions in donor surgery whenever feasible (ideal for thin and young donors). They are associated with lesser pain since there is no muscle division, minimal nerve division, better cosmesis, and lower incisional hernia rates. In the last 1 year, 44.8% of our donors had minimally invasive midline incisions. Currently, we have also incorporated laparoscopic approach for left lateral segmentectomy and laparoscopic mobilization of right lobes for hybrid laparoscopic and midline donor hepatectomies. At Medanta, we have performed 17 robotic liver resections and 3 robotic-assisted donor hepatectomies with 100% safety record. All these innovations have helped in achieving better scar, lesser pain, low morbidity, and early discharge for the donors. Liver transplantation in children under 10 kg poses special surgical, anesthetic, and intensive care challenges. In particular, the left lateral segments (generally between 200 and 350 g) from adult donors may be too big for small babies <8 kg, causing potential problems with fitting in the small abdominal cavity and inadequate portal inflow. To mitigate the problem of large-for-size grafts, we have employed a reduced or monosegment graft in 28 out of 38 such children (among the world's largest experience of such grafts) and have achieved 95% survival. Swap LT is an innovative endeavor to expand the donor pool in which the live-related donor of patient 1 donates his part of liver to blood group compatible patient 2 and live-related donor of patient 2 to patient 1 [Figure 6]. We were the first ones in India to report a successful swap and have performed 28 such swap transplants since (56 patients), with a 3-year patient and graft survival of 90%. Our center has the India's largest and among the world's largest experience of combined live donor liver and kidney transplantation (CLKT). The indications include primary hyperoxaluria and combined liver and kidney failure (CrCl <30 ml/min, creatinine >2 mg%). Of total, 29 CLKTs at Medanta, the 3- and 5-year survival was 78% and 74%, respectively. We pioneered the development of ABO-incompatible liver transplantation (ABO-i LT) in India and have performed 14 operations with a 1- and 3- year survival of 78% and 71%. It has also been performed at Amrita Institute, Kochi. The basic strategy in ABO-i consists of preoperative monitoring of antidonor blood group antibodies (ADA) and CD 19 count (surrogate for CD 20 count), preoperative reduction of circulating ADA by some form of plasmapheresis, reducing the antibody manufacturing cells (B-cells), reducing plasma cells (and hence B-cells), and postoperative strategies to diagnose and treat antibody-mediated rejection., [Table 3] details, our protocol for pre- and post-operative monitoring and treatment in ABO-i LT. 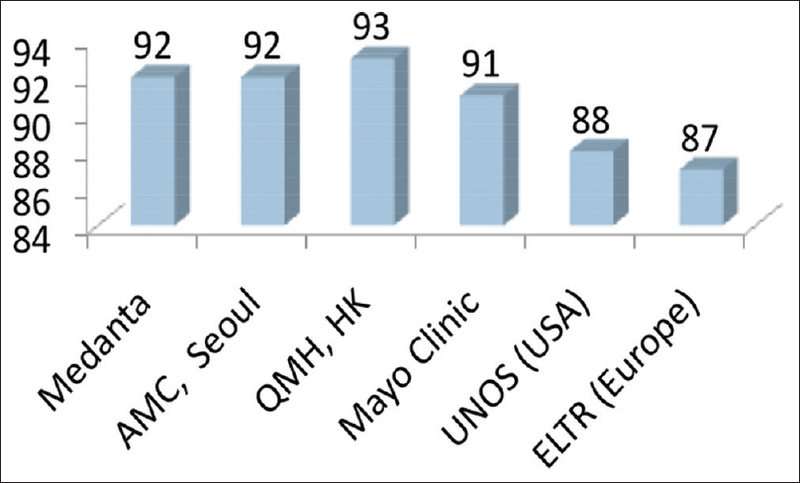 In India, unlike in the West, structured LT fellowship programs are still not available in the majority of the centers. However, at Medanta, we have been successfully training junior and senior surgeons in liver transplantation with a structured curriculum. We have already trained 56 fellows in 1–2 years fellowships. Currently, we have 15 fellows training at our institute with more than 45 papers in peer-reviewed international journals. Although the cost of LT has not increased in the last decade (Rs. 2–2.5 million), our focus should be to make liver transplantation affordable to a wider section of society by reducing its cost to about Rs. 1.2 million. With increasing experience, fewer pre- and post-operative investigations will be necessary, the hospital stay will be reduced, cheaper antibiotics and generic immunosuppressive drugs used, more deceased donor transplants will be performed, and the facility will develop in designated public hospitals. A closer collaboration between public and private sector hospitals is called for optimal resource training and utilization. India is now in the forefront of LDLT in the world. LDLT is possible for all types of recipients and indications with 95% success, with low incidence of vascular complications and biliary complications. Successful CLKTs are now routinely possible. For those without blood group matched family donors, 2 innovations are now successful: Swap LDLT and ABO-incompatible LDLT. Laparoscopic and robotic surgeries have made liver donation safer and more comfortable for living donors. While DDLTs have picked up steam in Southern India, there is still a large gap between demand and supply of organs. LDLT is essential to bridge this gap and continues to be the main curative option for the majority of patients in India suffering from end-stage liver disease and HCC confined to the liver. Belle SH, Beringer KC, Murphy JB, Plummer CC, Breen TJ, Edwards EB, et al. Liver transplantation in the United States: 1988 to 1990. Clin Transpl 1991:13-29. Ministry of Law, Justice and Company Affairs. The Transplantation of Human Organs Act, 1994. New Delhi: MoLJCA; 1994. Available from: http://www.health.bih.nic.in/Rules/THOA-1994.pdf. [Last cited on 2014 Jun 10]. Sibal A, Rajasekar MR, Soin AS. Liver transplantation in the developing world. Indian J Pediatr 1999;66 1 Suppl: S120-3. Department of Health and Family Welfare, Government of Tamil Nadu. Cadaver Transplant Program, Government of Tamil Nadu. Chennai: DHoFW; 15 October, 2008 Report of Donors and Transplanted Organs. Available from: http://www.dmrhs.org/tnos/donors-and-transplanted-organs-tamil-nadu- october-2008-october-2015/1940. [Last accessed on 2015 Dec 15]. IRODaT Newsletter. International Registry in Organ Donation and Transplantation; December, 2014. Available from http://www.irodat.org/img/database/grafics/newsletter/IRODaT%20Newsletter%202013%20.pdf. [Last accessed on 2015 Dec 15]. Soin AS, Kumaran V, Rastogi AN, Mohanka R, Mehta N, Saigal S, et al. Evolution of a reliable biliary reconstructive technique in 400 consecutive living donor liver transplants. J Am Coll Surg 2010;211:24-32. Choudhary NS, Saraf N, Saigal S, Gautam D, Lipi L, Rastogi A, et al. Rapid reversal of liver steatosis with life style modification in highly motivated liver donors. J Clin Exp Hepatol 2015;5:123-6. Yao FY, Ferrell L, Bass NM, Watson JJ, Bacchetti P, Venook A, et al. Liver transplantation for hepatocellular carcinoma: Expansion of the tumor size limits does not adversely impact survival. Hepatology 2001;33:1394-403. Mazzaferro V, Llovet JM, Miceli R, Bhoori S, Schiavo M, Mariani L, et al. Predicting survival after liver transplantation in patients with hepatocellular carcinoma beyond the Milan criteria: A retrospective, exploratory analysis. Lancet Oncol 2009;10:35-43. Soin AS, Mohanka R, Singla P, Piplani T, Menon B, Kakodkar R, et al. Segment IV preserving middle hepatic vein retrieval in right lobe living donor liver transplantation. J Am Coll Surg 2011;213:e5-16. Kakodkar R, Soin AS. 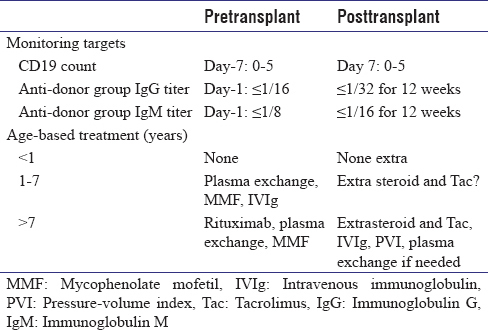 Liver Transplantation for HCC: A Review. Indian J Surg 2012;74:100-17. Soin AS, Raut V, Mohanka R, Rastogi A, Goja S, Menon B, et al. Improving safety of ABO-incompatible LDLT with a simplified protocol of LowDose rituximab and double-filtration plasmapheresis. J Clin Exp Hepatol 2014;4 Suppl 2: S82-3. Soin AS, Raut V, Mohanka R, Rastogi A, Goja S, Balachandran M, et al. Use of ABO-incompatible grafts in living donor liver transplantation – First report from India. Indian J Gastroenterol 2014;33:72-6.